How to upload GoPro HEVC 4K video to Facebook successfully and fast? Here's the method. We like share our GoPro videos to social sites like Facebook, story telling our exciting adventure, brilliant travel, as well as jazzy time with our family, friends or pets. In order to shoot high bit rate video like 4K at 60fps and 2.7K at 120fps to present moment as real as it actually is, GoPro has built support for more effective HEVC compression into its newer Hero 6 Black. However, HEVC 4K is not supported by Facebook, so we need to learn how to upload GoPro 4K HEVC video to Facebook from this article. ● What video files can be uploaded to Facebook? 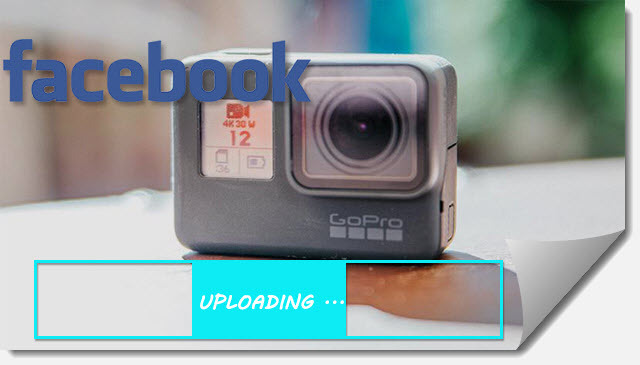 ● What's the maximum GoPro video length and size to upload on Facebook? There're limits on video size and length for uploading, and only when GoPro (4K) video is at or under 120 minutes & 4GB can it be posted on Facebook successfully. In addition, Facebook has a maximum of 30fps rendering. Any video uploaded at 60fps will be downsampled. Allow you to compress GoPro 4K HEVC to Facebook available formats like H.264 MP4/MOV/FLV and DivX AVI. By fully support Nvidia/AMD/Intel hardware acceleration, it delivers excellent video processing speed, while maintaining the highest possible quality thanks to hardware processing. - "HEVC Media does not show up in Quik on my new Windows 10 PC with a Core i9 Processor"
- "GoPro app shows HEVC cannot be used on my phone but it is a Note 8 (fully compatible with HEVC)"
- "When I try using Quik desktop app to download and edit the 4K 60 fps videos, I get the error message stating that my system in not capable of HEVC." All GoPro video apps have strict hardware requirements to handle 4K HEVC video. Even when the hardware itself is qualified, there're also a lot of software compatibility errors. Therefore, GoPro recommends transferring HEVC to H.264 with open source transcoder HandBrake when encountering 4K HEVC problems, which is also the second method we would come up with below. Facebook does not support HEVC 4K video, but why can we directly post and view it on Facebook? The truth is when we add GoPro 4K HEVC video and click "Post", the video will be processed for some time by formatting from HEVC to H.264 Facebook prefers. Nevertheless, it usually takes quite a long time to process GoPro HEVC 4K video with high bit rate or large size. - I uploaded a video file to Facebook about 9 hours ago, and it still hasn't shown up. How can I minimize the time it takes to process my video? - Long upload to Facebook: Despite using Studio to edit GoPro 4K HEVC footage to just 1 minute, it won't upload to Facebook. It will take hours and then tell me there was a problem!! How can i sort this out? Facebook is not skilled in transcoding GoPro 4K HEVC video. Therefore, professional video converter software is the best way to go. 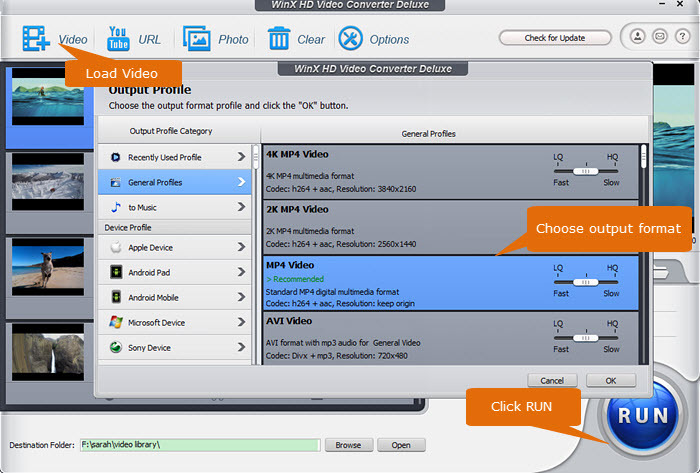 Since GoPro has already recommended HandBrake to convert HEVC to H.264, here we offer another good bet - WinX HD Video Converter Deluxe. Compared to HandBrake, it can compress GoPro HEVC 4K for Facebook more flexibly. Video Edit: Crop, trim, add subtitle, sharpen, rotate, merge, split, stabilization, noise reduction, snapshot, add effects etc. Step 1. Export GoPro Hero 6 HEVC 4K (60fps) video to computer via GoPro app or other tool alike. Free download it on Windows PC (Mac version here) and install it on computer. Open it and enter into Video Converter to standby. Step 2. Input source GoPro HEVC 4K video into WinX HD Video Converter Deluxe by clicking "Add Video" button or directly drag and drop. If you wanna perform batch conversion, just load the video files at this step. Step 3. Choose one Facebook friendly video format at the output profile, like MP4 (H.264) and MOV (H.264), AVI (DivX) and FLV (H.264), and click "OK" to move on. Step 4. Do some advanced settings on video frame rate (e.g 60fps to 30fps), resolution (e.g 4K to 1080p) and so on. WinX HD Video Converter Deluxe also features stabilizing GoPro shaky video, denoising source video, adding effects to GoPro source, as well as making a series of 4K (JPG) snapshots for setting as desktop wallpapers. Step 5. Tap "RUN" button to start video processing automatically. Then you're free to do anything else. Don't forget to check the final GoPro video for Facebook. Level-3 hardware acceleration makes video conversion or compression a snap, while no visible quality loss at all.